My Mum and Dad were visiting New York, and we took a side trip out of the city to see what we could see and have lunch. What I saw was a four leaf clover, right in the middle of a grass verge by the sidewalk. I don’t know how I spotted it. My family will tell you that, to me, Where’s Waldo is one of life’s great mysteries. But spot it I did. I stopped. Bent down. And picked it. 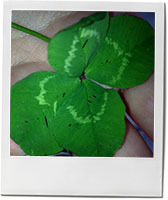 The idea of luck as currency appealed to me. What should I spend my luck on? It would take some thinking about. “I’ll think about it,” I said, carefully slotting the clover into the back of my notebook for safekeeping, as though it were the world’s most useful and magical gift certificate. On the way home a black cat walked in front of my path. Let me reiterate: I was on a path. A back cat walked in front of me. In a city of apartment dwelling felines, this is a singularly unusual event. “It’s adding up,” said Dad. “That’s it. We’re totally having a bet on the Derby,” said Jon. We walked back to the flat to drink coffee and look at photos. People that I love I the city that I love. And I felt extremely lucky, clover, cat or no. I love this description of how to make a traditional mint julep, and if you consider yourself a purist, I recommend that you heed the writer’s advice. But this version is the version that I actually prefer to drink. 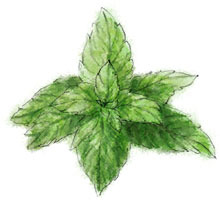 Extra frosty, extra minty, with no annoying mint bits in the teeth – and it’s easy to make a pitcher using the same basic proportions. This entry was posted in The Wednesday Tipple and tagged four leaf clover, Kentucky Derby, luck, mint, mint julep, mint syrup. Bookmark the permalink. Lovely. And I love your drawings. I am new to your site and look forward to more. Thank you! My husband Jon does the drawings, and I will pass on the lovely complement. I was wondering if I could use this cute mint julep picture on a Derby party invitation or if there was somewhere you sell your drawings! Thank you in advance! Carry on! Thanks for asking. I agree. I think it will make a very cute invitation.